I know only one Gen X-er who still works at the company that gave him his first job: my older brother. He is as satisfied with and loyal to his Fortune 500 employer today as he was when he left college 26 years ago. The company is certainly imperfect and has had its share of good and bad performance in the time he’s been there. However, even in difficult times, my brother stuck with the company not for potential financial gain, but because his employer was intentional in investing in and developing his leadership skills and overall capacity to lead. He has consistently been entrusted with new assignments that stretch his skills and has benefitted from clear, two-way communication with his supervisors to evaluate his readiness for future leadership within the company. My brother and I have often discussed the connection between intentional leader preparation and improved organizational performance within companies like his in comparison to the less intentional and weaker focus on developing future leaders I see in higher education. 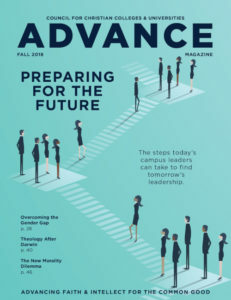 Faced with a disrupted landscape of higher education, loss of predictability in planning, an underrepresented leadership pipeline, and a need to cultivate more effective leadership identities, today’s academic institutions need to bring a greater level of intention to developing leaders ready to navigate the complex waters ahead. This intentionality will not only lead to greater employee engagement, improved institutional performance, and stronger missional impact, but it will also provide structural opportunities for those typically underrepresented in leadership positions to be identified and positioned for success. Higher education has experienced significant disruption in the last 20 years. Institutions in the U.S. are experiencing unpredictable student enrollment and rapidly rising costs, and social, cultural, and legislative shifts have created additional pressures in areas of religious protections, hiring, and community standards. Many institutions have experienced the new reality of shifting from a seven-year plan, to a three-year plan, to a “let’s try and forecast next year as best we can” plan. Meanwhile, higher education institutions in both the U.S. and Canada find themselves situated in strong economies, with ever-elongating streaks of record job growth, low unemployment rates, and broad gains across a range of industries. These factors have led to a competitive labor market in higher education, with institutions experiencing rising employee turnover rates. As the economy improves, employees – especially the well-performing ones we want to keep – have more job options. Industry experts estimate direct replacement costs can be as high as 60 percent of an employee’s annual salary, with total turnover costs as much as twice an employee’s salary to recruit, hire, and train a new worker. If we agree on the premise that the mission of the Christian college or university is to provide a life-changing education rooted in the gospel of Jesus Christ and to graduate alumni who bring about far-reaching positive societal change, then preparing people to lead and shape our institutions is profoundly significant. Unfortunately, many commentators would suggest that there has been all too little intentional operational focus on developing that necessary leadership. The uncomfortable reality for higher education is that it is a sector largely unprepared for the impact of a limited leadership pipeline due to aging leaders, unprecedented turnover rates, untested mid-level employees, structural inhibitors, reduced budgets, and increasing employee reluctance to pursue institutional leadership positions. These limitations not only have financial costs, but also intangible and arguably more significant costs in terms of momentum of mission, organizational effectiveness, and direction. In serving alongside a long-serving president who is transitioning out of the chief executive role, I am seeing the significant direct and indirect financial, cultural, and missional costs of leadership transition firsthand. Recognizing the need for employees with different competencies, experiences, and perspectives to lead in a disrupted landscape, it is crucial for institutions of Christian higher education to address the major systemic challenge that can prevent a successful future: an inadequate leadership pipeline. Research suggests 50 percent of higher education’s senior administrators will turn over in the next decade, along with 25 percent of college and university presidents. A 2012 study of presidents who lead institutions in the Council of Independent Colleges revealed that almost half planned to leave their position in the next five years. Annual business and human resource surveys from Deloitte continue to highlight that the ability to effectively develop leadership is the perennial concern of all the organizations surveyed. This means that now, more than ever, institutions must consider what they want their leadership to look like in the near future, particularly when it comes to the diversity of their leadership teams. Research has shown that diverse teams lead to greater efficacy in problem solving, derive higher financial returns, and increase innovation. Diversity of background, perspective, and experience are increasingly valuable characteristics in leadership. Additionally, it has been proven that student outcomes improve when students see leaders who they believe have similar perspectives and/or experiences to their own. Yet CCCU institutions, by and large, have inadequate leadership pipelines to meet this need. This is not to suggest that those in the pipeline are inadequate themselves, but rather to recognize the reality for Christian higher education that women and people of color are severely underrepresented in academic and non-academic leadership roles. 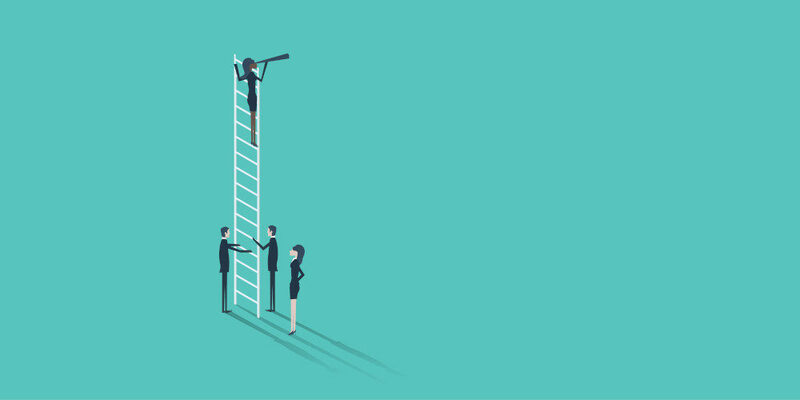 For example, there are more than enough qualified women to fill available leadership positions – actually the pipeline is creating more women than men for academic leadership – but systemic barriers can prevent women from obtaining senior-level positions. Rather than simply replicating the long-standing, predominantly white and male model of senior leadership in Christian higher education, it is important to intentionally identify and develop more emerging leaders who are women and people of color. If we are not intentional about addressing the future composition of our institutions’ leadership, then I believe we harm our ability to be missionally effective. This is where it can be helpful to look at the example of companies like my brother’s employer. Successful succession-planning strategies in the for-profit sector have been extensively documented, with General Electric, Johnson & Johnson, Allstate, Procter and Gamble, Hewlett-Packard, Lincoln Electric, Southwest Airlines, and Whole Foods Markets touted as exemplars. These companies have prioritized purposefully developing individuals, largely for a strong internal leadership bench and a robust organizational performance, employee engagement, and customer satisfaction. Thus, we need to study our respective leadership pipelines and bring to them the level of attention and intentional response as would any of these Fortune 500 companies. College and university leaders need to talk about the institution’s pipeline, form a framework for one if needed, and allow data to inform their actions to develop a diversity of ethnicity, gender, age, and perspective within those pipelines. Talk about your leadership pipeline with regularity. Ask leaders to complete a position assessment to help identify possible successors, both internal and external to the institution. Develop an illustration of these leadership positions, along with successors, as an institutional pipeline. Review the pipeline through a lens of diversity: Who are you seeing, and who are you not seeing? Why? What does your preferred pipeline look like? What are the possible barriers? Consider the strategies needed to enhance your pipeline, such as identification, training, coaching/ mentoring, advancement, development plans, and implicit bias training. Collective endorsement – how others in the broader social environment acknowledge the individual as a leader or follower. They suggest that effective leadership or followership comes when claims and grants are reciprocated, with obvious challenges for leadership if they are refuted. Many of us can recount examples in our institutions where leadership was claimed due to title, but not granted by the organization – maybe due to style, actions, or the lack of recognition or endorsement in a high-relational culture. Event visibility (e.g. speaking in chapel, participating as a panelist on stage, or being recognized publicly by a senior leader). Appointment to serve on or chair a committee or task force. Selection to participate in leader development programs. Opportunities for stretch assignments, job shadowing, job rotations, or lateral career moves. Our commitment to intentionally prepare and deploy a richly diverse cohort of future leaders needs to be for the future longevity and effectiveness of the mission of our institution, not for our own benefit or exaltation. When thinking about the reason for a purposeful approach to developing men and women to lead in the complexity that is a 21st-century institution of higher education, I often come back to the words of former college, university, and seminary president David McKenna: “Our legacy will be written not in the good things that we have done as Christian leaders, but in the great things that our successor will do.” May it be so. Andrew Barton is the chief of staff at Azusa Pacific University (Azusa, California).